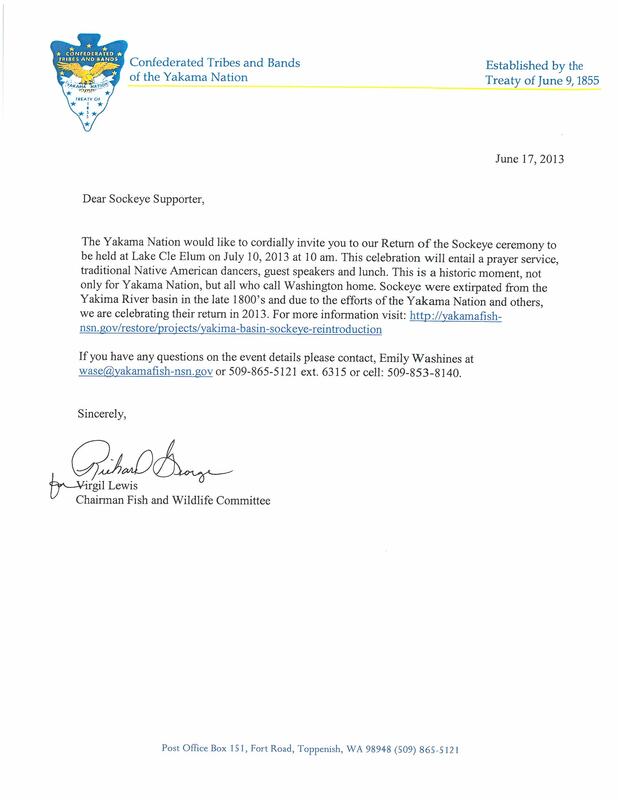 The Yakama Nation would like to cordially invite you to our Return of the Sockeye ceremony to be held at Lake Cle Elum on July 10, 2013 at 10 am. This celebration will entail a prayer service, traditional Native American dancers, guest speakers and salmon lunch*. This is a historic moment, not only for Yakama Nation, but all who call Washington home. Sockeye were extirpated from the Yakima River basin in the late 1800’s and due to the efforts of the Yakama Nation and others, we are celebrating their return in 2013. *We ask that you bring side dishes, following this alphabet.